New Hampshire | Retired and Lovin' it. We held off leaving Meredith Woods Campground in the hopes that the part for The Beast would arrive. James ordered shipped next day. 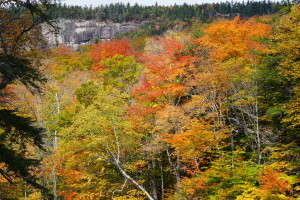 In the wilds ofo New Hampshire, next day can become “next few days”. We couldn’t wait past 2 pm and headed off. 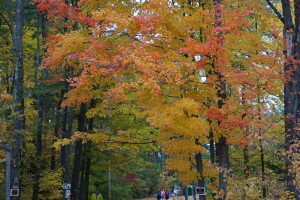 With the Keene Pumpkin Festival moved to Laconia, Meredith Woods Campground was sold out for the weekend! Our goal is to arrive Ed O’Neil’s place on Monday. The distance is short. 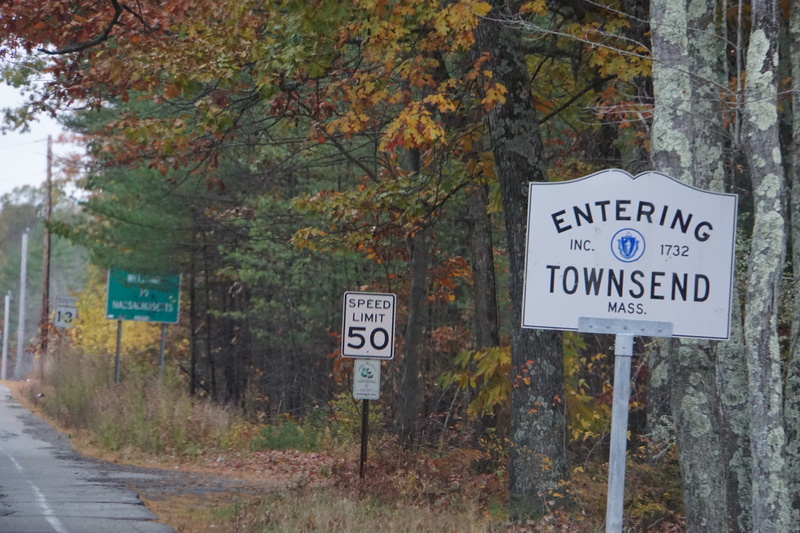 we thought we’d take some back roads through New Boston and on to the Mohawk Trail before dropping gown to Amherst. From Meredith Woods we took SR 104 west to I-93 south. Both roads are smooth and a great ride. 104 is a two lane road with little traffic. From I-93 we took SR 13, SR 77, SR 114, and SR 77. These roads are two lane with surprisingly little traffic. 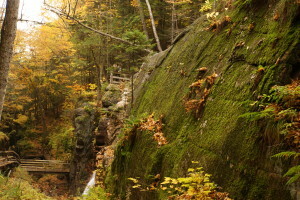 A bonus, they’re in very good condition and go through beautiful scenery; over rivers and along creeks and streams, through very small towns. We called Robert at Friendly Beaver Campground, our stop for the evening, to make a reservation. Ellen asked if there was a market nearby and Robert said he had some supplies at the store: eggs, bread, milk, some meat. OK we’re good for the night we celebrated and headed off to find Friendly Beaver. Again the GPS miss-located the campground and we made a few U-turns before finding it. It is about a quarter of a mile further up Old Coach road than the GPS thinks it is. While checking in, I asked if they could recommend a local restaurant. I had not seen a single eatery driving in! 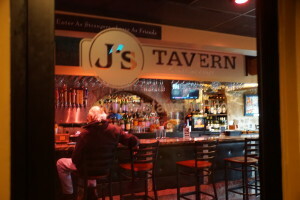 “Yes, you’ll find Molly’s Tavern if you drive back down Old Coach Road and go south. That’s a left. You can’t miss it.” We had come in from the north. The food the store stocked was not super fresh. We opted to drive to Molly’s Tavern. That was a great decision. 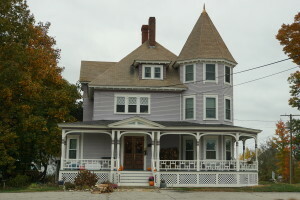 Molly’s Tavern sits on SR 13 south of New Boston and you cannot miss it. 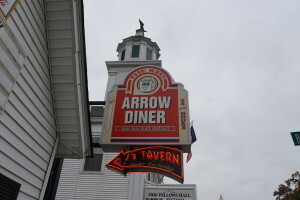 There are two buildings, the restaurant and the tavern. Walking from The Beast, the scent of burning wood filledl the air. 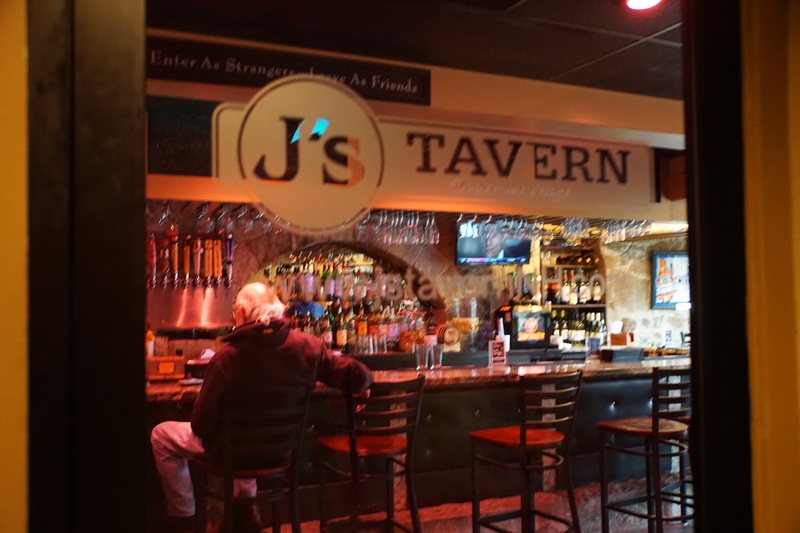 We stopped a waitress as she was entering the tavern and asked what the difference was between the two. 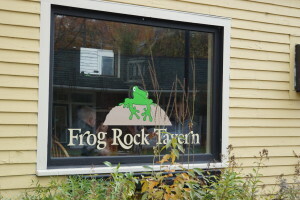 They offer and identical menu, but the tavern has a bar. if you order drinks in the restaurant they’re brought from bar. Then she said, “Oh and the Tavern has a fireplace. 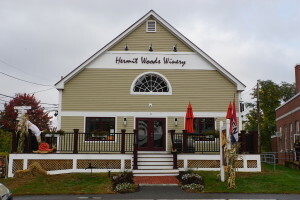 The restaurant doesn’t.” It was cold and the thought of sitting by a fireplace won out. We ordered the specials: Ellen, the stuffed jumbo prawns; Ron, the filet with asparagus. The food was good, but sitting by the fireplace was wonderful. Over the course of our meal, the Tavern filled. This was clearly the place for the locals to go for a fun time out on a Friday evening. We drove back up the hill and settled in for the evening. Site #206 has a clear view of the south. we had no trouble with sat. reception. Bill Maher is on vacation; Real time was a re-broadcast of Bernie Sander’s interview et. al. 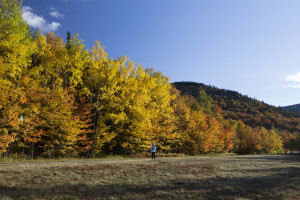 The next morning we saw just how many others were camping late in the fall in New Hampshire. The campground was not full, but it was far from empty. The 200’s section was about half full. 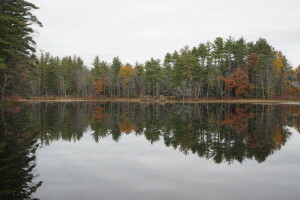 The beauty of camping in the off season in New England is availability. You never have to worry about getting a reservation at a campground. It’s the number of campgrounds that have closed after Columbus day that is the problem. Still, we have been able to find an open campground almost everywhere we went. 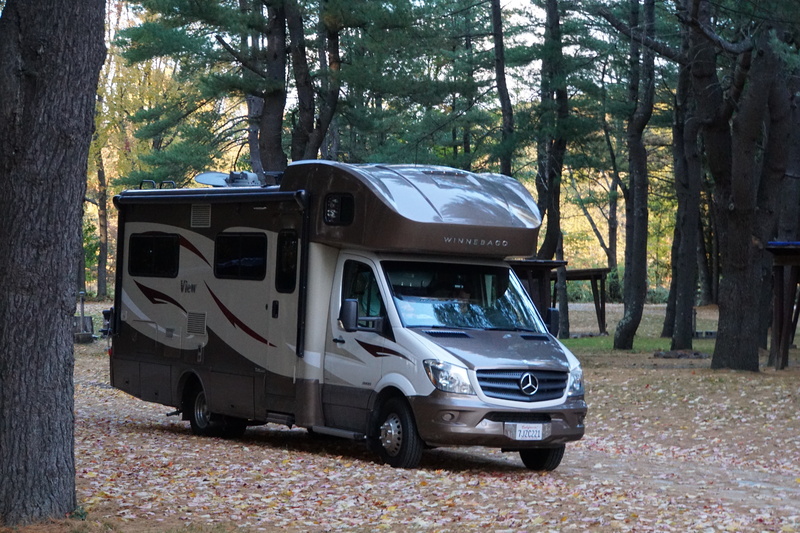 The one exception was south of Portland Maine where we resorted to an Elks Lodge and Boondocking and even that was not a hardship. 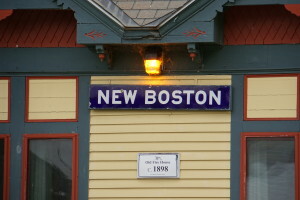 New Boston was a trip. It is a very isolated sleepy little town, but it is beautiful. We were happy to push on into Massachusetts the following day. 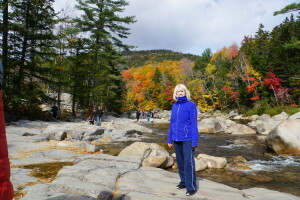 This entry was posted in New Hampshire, RV Trips, To New England and tagged Fall Foliage, Friendly Beaver Campground, New Boston, New Hampshire on October 25, 2015 by up4air. “Full Everything” is my best summary of this campground. It is modestly priced; we have paid much more for less. Site #219 may be the only site with a view to the south for Satellite reception. 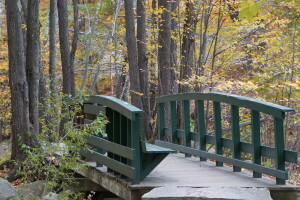 We love the tree lined campsites, huge rock fire pits, and indoor amenities the campsite has to offer. We have not used the pool table or the pool or Jacuzzi, maybe we’ll do that tonight. James called last night to say he would be at camp between 2 and 3 and could look our hot water pressure problem then He’d call when he was 30 minutes out to give us time to get back to the campsite. Our plan for this morning was to sleep in, have a slow relaxed breakfast, then decamp and explore Meredith. We’d be back at the campsite around 1 pm, have lunch, and wait for James. 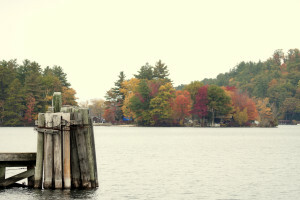 Meredith sits on the north west side of Lake Winnipesaukee. We’ve explored Meredith, had lunch, James called, and we’re waiting for him to show up. Meredith felt much more lively than Laconia. 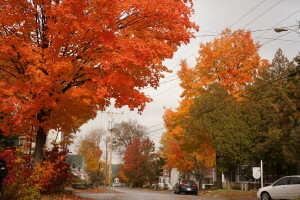 It is still a small town that rolls up the sidewalks off-season, but it has a welcoming “at home” vibe. It was spitting this morning; overcast and threatening to rain. By the time we reached Meredith the weather was threatening to be sunny while still overcast. The sun did pop out a few times while we walked the town. 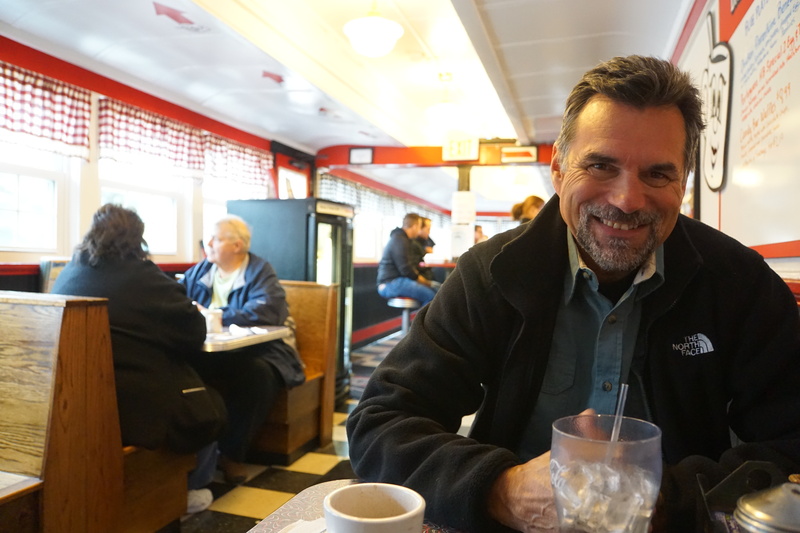 It was tempting to stop in the open restaurants and ask about steamers, but we held off. We did not have the time to squander, even on steamed clams. Around 1 pm we headed back to Meredian Woods. Jim stopped by moments ago and checked out our system. He said that our electronic pressure relief valve AKA crossover valve was malfunctioning. It has nothing to do with a valve on the water compartment inlet valve! We’re good in winter conditions. Jim and I switched water and flow valves to diagnose the problem. Jim called three outfits to have a pressure relief valve delivered overnight. Two could have it in weeks, a third is shipping it for overnight delivery. There’s no guarantee that the part will arrive tomorrow. If it does come in Jim can make the repair. If not he said he’d call and just have the part shipped back. He did not charge us for his time. He said he was here anyway. The part is $108. 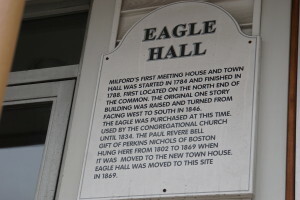 We are staying a second night here in Meredith New Hampshire. The campground is beautiful. we just played a round of 8-ball. Ellen sunk the 8-ball and won. 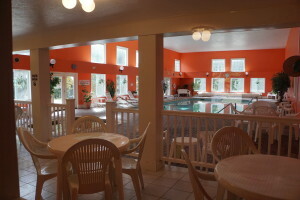 We’ll hit the Jacuzzi and pool later this evening after dinner in Meredith. Steamers anyone? This entry was posted in New Hampshire, RV Trips, To New England and tagged Meredith Camping, Meredith Woods Campground, pressure relief valve on October 22, 2015 by up4air. Mohammed, our service rep., expected us. 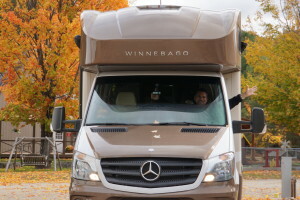 We joked about cross country travel, then focused on our Sprinter RV. It would take about two hours for service if they didn’t find anything amiss. Prime would fill all the fluids, change the oil and oil filter, and perform a software update to address an annoying gong that sometimes triggers at start-up for no reason. He said it’s a known problem with a software fix. 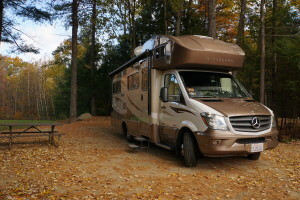 Prime also sells Sprinter RVs, specializing in the Airstream. There were two RVs parked outside and we had to check ’em out. The larger Airstream was locked, but the Road Trek was open. It was well setup, but short, and even with windows on all sides it was dark inside with a full wood interior. It was priced at $87K. Heading back into the waiting lounge, I opened the door for a well dressed woman who overheard Ellen wonder where we’d find a good restaurant for breakfast or lunch. She turned and said, “Lois’ Natural Marketplace is a great place to eat. They’re “all natural”, but pricey.” We thanked her, and headed across the street to Lois’ place. Lois’ looks like a market. The front doors open onto rows of produce and products as you would see in any typical small up-scale market. I walked past thinking the cafe would be around back in another building. Ellen disappeared into the shop. Recognizing my mistake, I walked past the rows of exotic beers, organic produce, and herbal remedies to find Ellen standing at a deli counter. Lois’ makes everything they sell at the deli pretty much from scratch. Arrayed under glass were heaping bowls of pasta salad with spinach and goat cheese, diced beets with spices, home-made soups, baked goods like the coconut-strawberry or blueberry scones (We both said “Michele” our friend living on Whidbey Island, Washington state; she has a small business baking, yummy scones,cookies, etc… “Hi Michele and Jerry” 🙂 ). Hand written in chalk above the counter was their menu, a list of yummy sounding sandwiches. We each had our morning espresso drink and sandwiches. Ellen’s was an egg salad and mine, a ham and brie. These were very delicious. Usually the ham in a ham and cheese predominates. Not so with this one. There were thick slices of brie which dominated the ham, but in a wonderfully different way. There was a trace of something sweet; small slices of something like date or marinated onion. Before our sandwiches were made, The owner and Ellen chatted about travel. I noticed Grgich Hills Chardonnay on their wine shelf and had to look over their wines. Sitting atop a display case front and center were three bottles of Historic Series Madeira: Baltimore Rainwater, Boston Bual, and Thomas Jefferson. I asked Lois about the wines and she hailed their wine buyer. The Historic Series Madeira is made in the traditional way in estufas. What makes the Jefferson special is the blend. This wine includes some 80 year old madiera. Ok, I was hooked. I thought I’d get a bottle and one or two of the unusual beers they carry. Our sandwiches arrived and were gobbled up with joy. We cruised the isles one last time, then crossed back over Rt 1 to Prime. The Beast was no longer in sight. This time the lounge was nearly empty, the young well dress woman who told us about Lois’ was at the cashier’s counter, and there was a Smart Car sitting at the far end of the lounge, in a hall leading into the show room. Time for a test drive! A well dressed salesman was having an animated conversation with a customer. Not wanting to interrupt I walked past, but the salesman stopped me to ask, “Can I help You?”. “Yes, I would like to test drive a Smart Car, but I don’t want to interrupt your conversation. 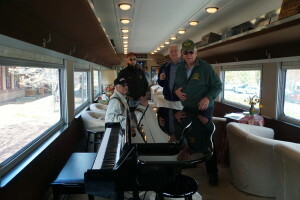 : To which Art Starr, the salesman, said, “Oh that’s ok, I sold Andy an Airstream in August. We’re just talking. Let me get someone to give you a test drive. Are you interested in buying today? ” I said no not today, but I would like to see if I like the ride and might buy one in the future.” “Ok”. Moments later Art introduced Jerry Lynde and keys in hand off we went to find a turbo-charged 2016 Smart Car with a manual transmission, Knowing it’s a two seat model, Ellen chose not to take part. All of the small cars I’ve driven feel like a sardine can with wheels; they do not feel like cars. The Smart Car is different. It does drive and handle surprisingly well. It is nimble. Fast is not a word to couple with “Smart Car”. Even with a turbo it cranks out an anemic 100 hp. That’s fine with me. As a four down tow vehicle, the Smart Car seems perfect. I liked it! Unfortunately it was the 2016/manual transmission/turbo model which is their top of the line and makes buying an inexpensive 2010 model less likely. The Beast was parked right in front when we walked back. Best of all it had been WASHED! 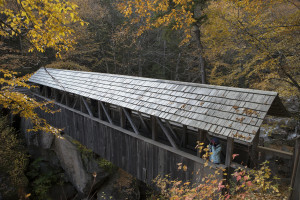 Gone was the dried on salt from our drive on the Kancamagus Highway. 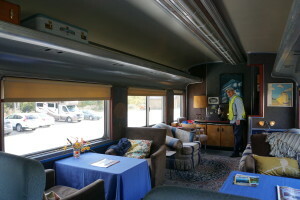 Jerry and I were talking in the hallway when Art walked up to ask how I liked it, followed by Ellen who asked if she could see inside the Airstream out front. Art said, “sure I’ll get the keys” Jerry and I parted and Andy walked up to discuss RVing, living, tow vehicles, and share experiences. Then Art came back with the keys and said, “Ok, let’s do this”. With Ellen in tow, he headed outside as I said, “Take my wife, Please!”. We all had a chuckle. I really did not want to see inside the Airstream. I was absolutely sure it was gorgeously appointed and priced accordingly. Andy and I continued our conversation and eventually Ellen and Art came back. Kidding I said, “I can see we’ll return to CA with a new RV. 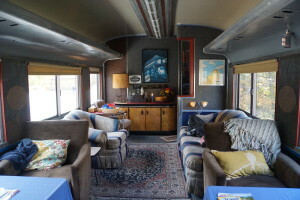 We can just swap our stuff over and continue on.” We joked about it for a while, but it was clear to all that we were not interested in buying, just in comparing our Winnie with the Airstream. 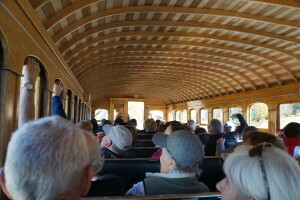 Ellen was impressed with the leather and marine quality wood interior. It was beautiful. Art pulled out a brochure to show us another model’s layout. We all said our goodbyes. Time flew, our two hour appointment had come and gone without our being aware of time passing. As service experiences go, this was one for the record books: Great people and a job well done. We started heading south, me thinking we’d head to Hampton Beach, when Ellen blurted, “But we haven’t seen a moose!” We have not. 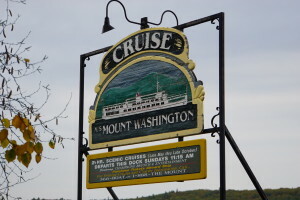 And she added, “you wanted to see Winnipesaukee.” True. 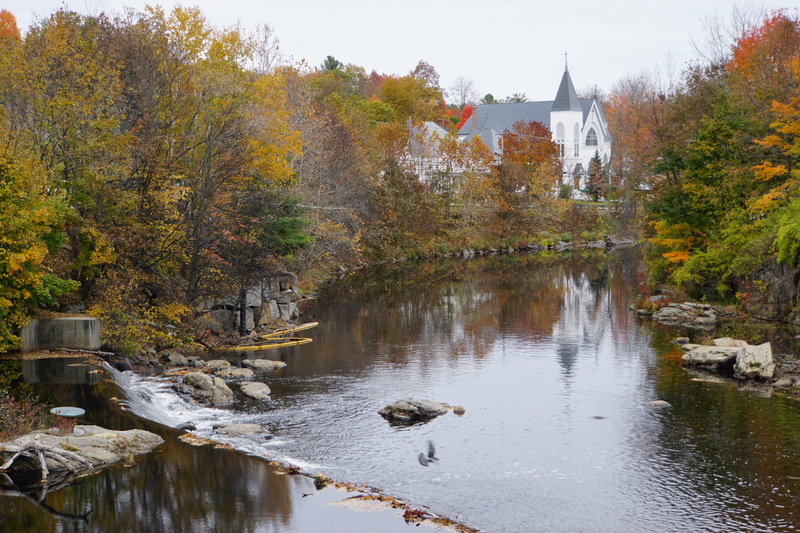 We adjusted our plans and headed to Laconia, New Hampshire. 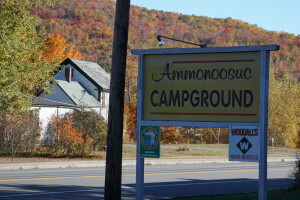 On the way we stopped to locate a campground close to Gunstock Mountain. 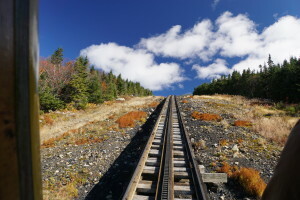 We drove all the way to the Gunstock Ski area without finding the campground. The views on the way up the mountain were well worth the drive. 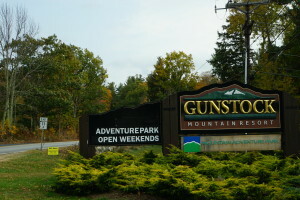 The Gunstock Mountain Zip Line is open on the weekends, another score! 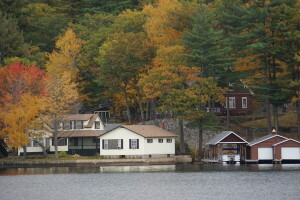 Awe Shucks, we’ll have to dally around Lake Winnipesaukee for a few days? 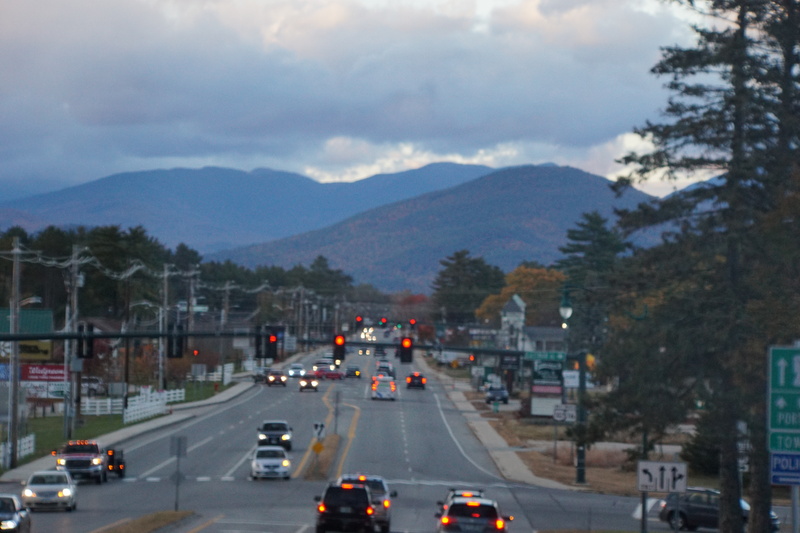 Our first sight of Lake Winnipesaukee was from a bridge over the very southern part of the lake. There was a turnout a half mile further up and we stopped to soak in the beauty. The sky was overcast; with the sun poking through time to time. Ellen headed off along the lake as I took some long shots across the lake. Lake Winnipesaukee is breathtaking. 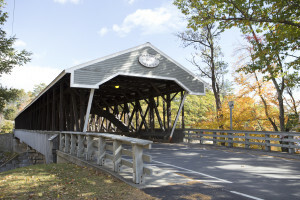 It is huge with a vast number of inlets and bays and a favorite place for people from large cities in Massachusetts to vacation and own vacation homes. We drove on to Laconia, which was a bit of a disappointment for us. It could be that we didn’t find “happening Laconia”. It felt like a depressed town with very little life. We had trouble finding parking. Our first choice was excellent, but as we walked toward town we passed a “No Parking Cars will be Towed at Owner’s Expense” sign. My first thought was, “Sure, tow a 6 Ton RV!” My second was more rational, geez we could be towed and we’re parking behind an urgent care facility. We moved The Beast. 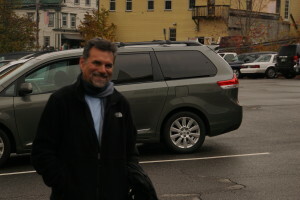 We found parking in the lower lot of the Landmark Inn. We are both hungry for a large bucket of steamed clams. The Lobster Shack in Portland did not have them. 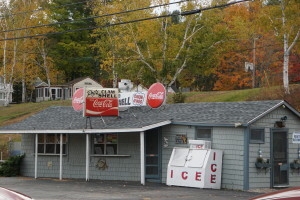 We passed numerous shops and shacks with signs screaming “Steamers” near another sign saying “CLOSED”. Ok, the concierge at the Landmark should know where we can find some steamers, right? We asked and were told that O’s just down the road five miles was a superb local restaurant that serves steamed clams. We also asked about parking in the lower lot and being towed. The front desk does the towing, we’ll be OK parked there. 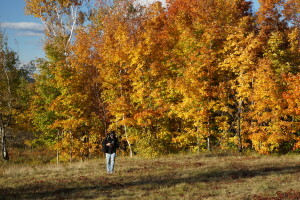 Great, we walked Laconia with waning enthusiasm then were off in search of O’s. 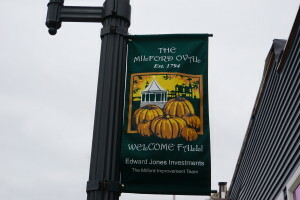 There were signs for Laconia’s pumpkin festival this weekend. 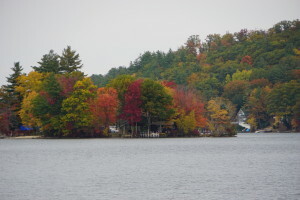 We’re going to stay a few days on Winnipesaukee, we might check out Laconia’s Pumpkin Festival. It might just redeem Laconia. 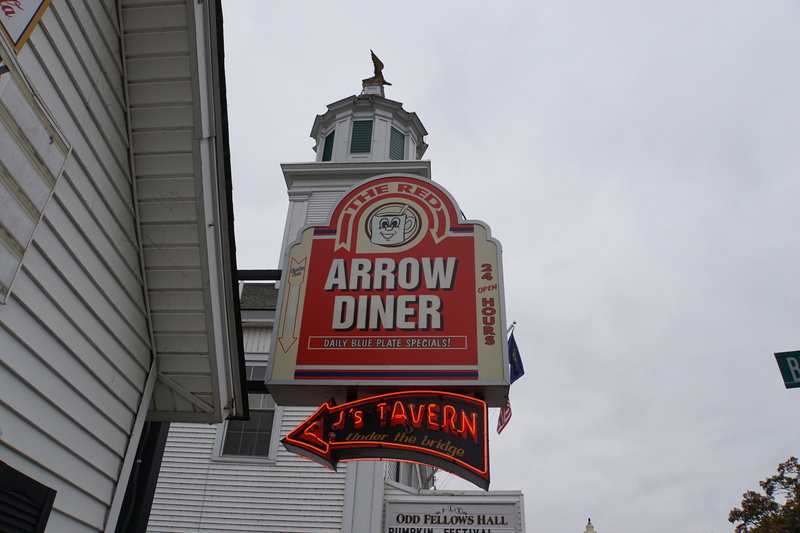 We drove the five miles and found a 99 restaurant. 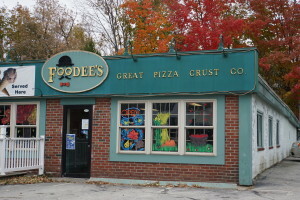 This was definitely NOT the place for steamers and was one step above fast food. (Sorry 99) By now we were not sure of the restaurant’s name; Ellen thought they said O’s. I called the Landmark and was reminded that the restaurant is “O’s”. 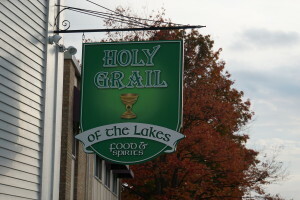 I then found a listing for O’s, called them, and learned that they do not serve steamed clams. This was a bust. 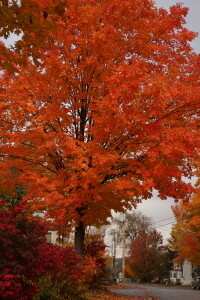 An update on Laconia and the pumpkin festival. 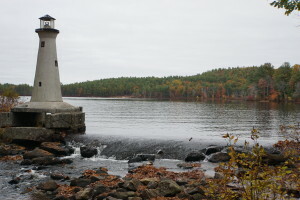 The Festival had been held in Keen NH for years, but it was moved this year to Laconia. Another competing festival will be held Swanzey. How Strange. 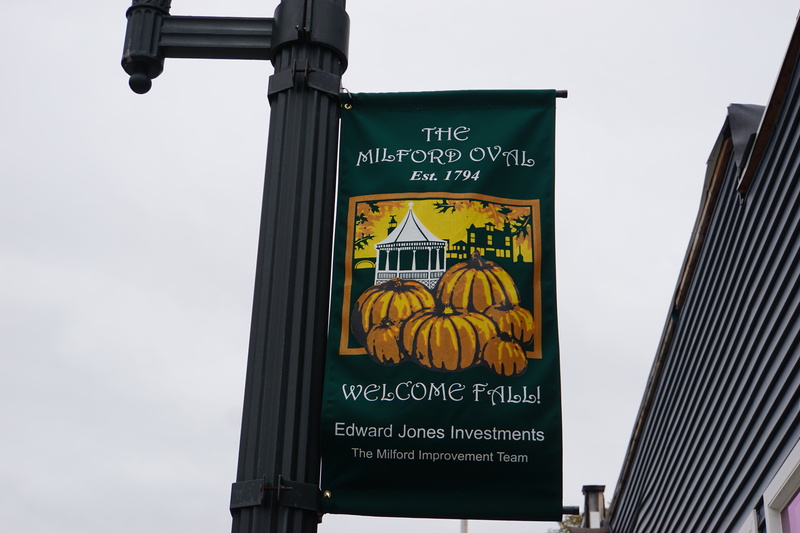 Here’s some background on the Pumpkin Festival. Somehow it fell to me to find a campground. I found one close-by and called. A live person answered! I said, “Hi. Great a live person.” She said, “Yes” and laughed merrily. I then said, “That probably means you are open, am I right?” She said, “No” and chuckled. Then she said, “but there is a year round campground not far from us. 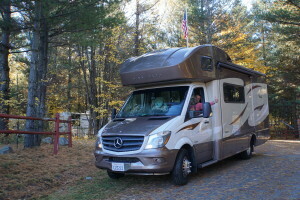 Try Meredith Woods.” I rang off, found Meredith Woods on AllStays, Ellen called, and we had our campground for the evening. The GPS miss-locates the Meredith Woods Campground. We passed it, turned around and passed it again. I pulled off to turn around and a black jeep followed me off the road. Great, that’ll make turning around difficult, I thought. The jeep pulled up aside The Beast, a fellow got out and said, “You’re looking for Meredith Woods, aren’t you?” “Yes”, I said. He said, “It’s not located correctly on our GPS either. It is up the road the way you were headed, just right at the blinking yellow light”. With many thank you’s off we went. There was a huge sign for Meredith Woods facing us as we approached the blinking light. 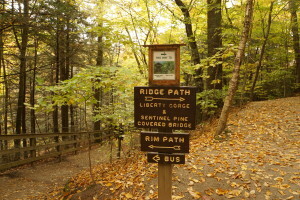 Coming from the other direction, the sign is hidden from view. We were “home” for the evening. Logan welcomed us, we registered, and could back into site #219. We have full everything tonight. It’s worry free as compared to boondocking. Even better, Meredith Woods is open year round and has an indoor heated swimming pool and Jacuzzi, heated restrooms with showers, a rec. room with a pool table, old time jukebox, games, books, and a patio overlooking the pool. All indoors and all heated. 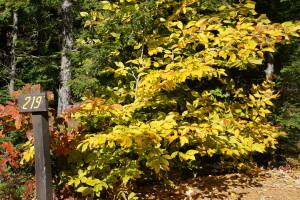 The campground with its heavily wooded campsites is very appealing. For dinner Ellen heated the pasta salad, diced beets, and scones we bought at Lois’ Natural Kitchen earlier today. I enjoyed a Shipyard IPA or two, saving the special beers from Lois’ for later in the week. The Beast has developed a hot water pressure problem. It looks to be a valve just inside the water inlet that may have been damaged during the freeze we had in New Hampshire. I had hoped that the light in the basement water compartment would generate enough heat to avoid freezing. I’ll have to either swap out the diode lite for a 40 watt light, or wire in a separate light circuit. That’s the only issue we had with sub freezing temperatures over a twelve hour period. It’s the first time I used the gray and black tank heater. James, a repair guy, will drop by this afternoon to fix the problem if he can. He diagnosed it over the telephone. Apparently it is a common failure. James comes highly recommended by Logan @ Meredith Woods. Stairs that fail to extend is our first problem. 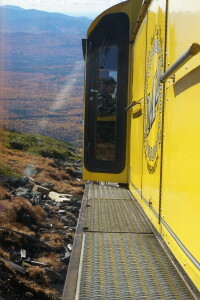 It appears that opening the side door and closing it before the motor has fully extended the stairs causes the problem. With the door closed, the stairs retract as you’d expect. Sometimes they stay retracted. Opening or closing the door makes no difference, the stairs won’t budge. 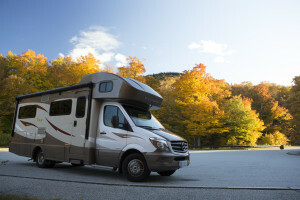 A fellow at Camping World mentioned that this is a common failure for all RVs. He simply tapped the stair motor with a hammer a few times and the stairs came back to life. Since I’ve been using our trusty rubber mallet to coax the motor to life. I never have a problem with the stairs unless we open and close the doors rapidly. 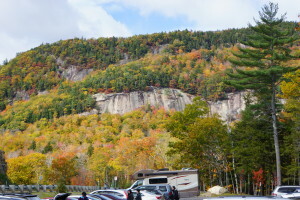 This entry was posted in New Hampshire, RV Trips, To New England, Travel Resources on October 22, 2015 by up4air. We left the Lincoln/Woodstock KOA close to checkout time. 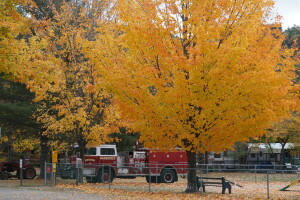 The crew was busy cleaning and closing the campground. 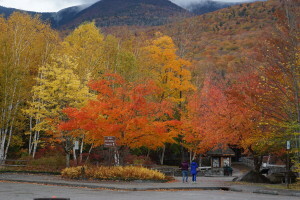 Luckily, We have been able to find open campsites as we travel the White Mountains. 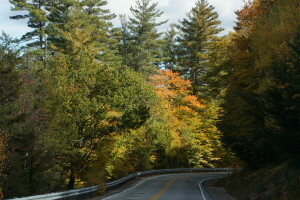 We drove north on I-93 for a few miles before turning east on SR 112,, the Kancamagus Highway. 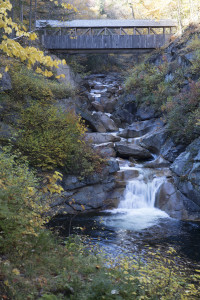 One of the most scenic highways in New Hampshire is the Kancamagus Highway, SR 112. It rises over a high ridge in the White Mountains and drops back to follow the Swift River into Conway. The Beast handled the climb to the ridge easily. Air temperature was at freezing and dropped steadily as we climbed to the pass. There was frost and ice near the top along with wet patches from salt melted ice. Controlling speed on the down grade to the river was more problematic. The grade descending was not so bad; a low gear kept The Beast’s speed slow for the most part. Just running in a low gear at 35 mph was not always sufficient. I prefer to brake as little as possible on downgrades to avoid over heating and either warping or burning the brakes out. 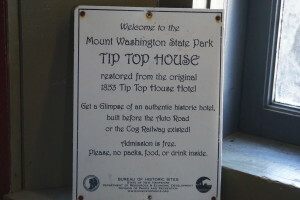 The views from the ridge and at scenic overlooks are not to be missed. We missed some of them, the turnouts were iced over. The road had been salted, but not the turn-outs at elevation. We chose not to risk it. Back at lower elevation (and higher temperatures) we stopped at scenic pullouts. The highway is not as winding as some of the other roads we’ve driven. In fact it is pretty mellow with easy sweeping turns until it runs along the river and even then it’s a fun, non-taxing drive. 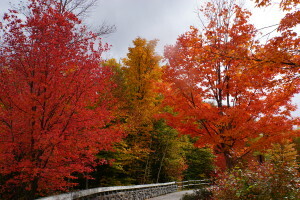 The drive along the Kancamagus Highway is a beautiful as the guide books say. 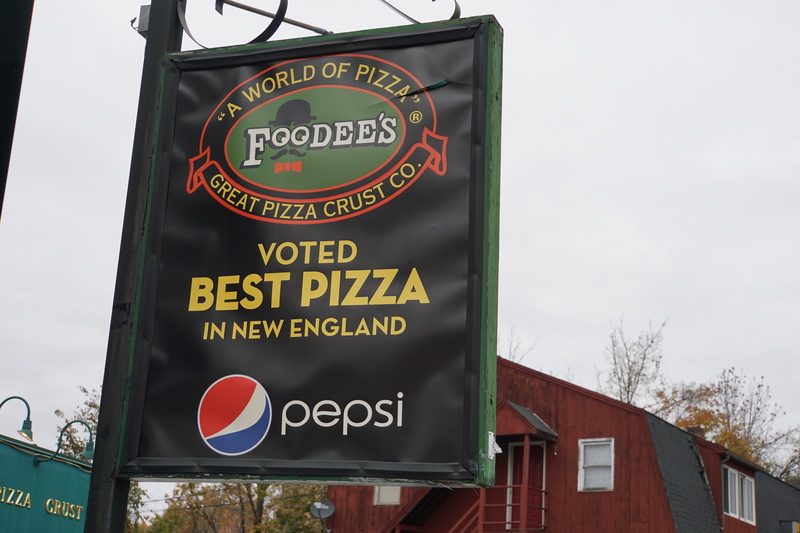 We would have stopped frequently but for the cold weather and a desire to reach North Conway before the JETS football game at 1 pm EST. We did stop at a scenic turnout close to Conway. 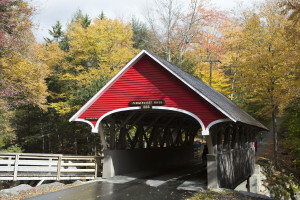 There are two covered bridges in Conway New Hampshire. We thought we had passed the first one as we drove into Conway to take SR 16 north. Following the Rand McNally GPS a bit too closely, I turned early onto Washington street about 200 feet ahead of the SR16 turnoff. 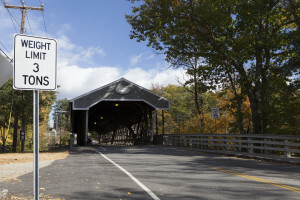 No problem, I thought as I negotiated a right turn, I’ll just continue up this road, go over that covered bridge ahead with a load limit of OOPS. The load limit was 3 tons. The Beast weights almost 6 tons. That’s not going to work. I had to make a U-turn on Washington street ahead of the bridge. Oncoming traffic was understanding and the U-turn was no big deal. 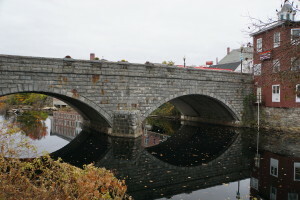 I turned into a parking lot across the street and behind me to get a closer look at the bridge. 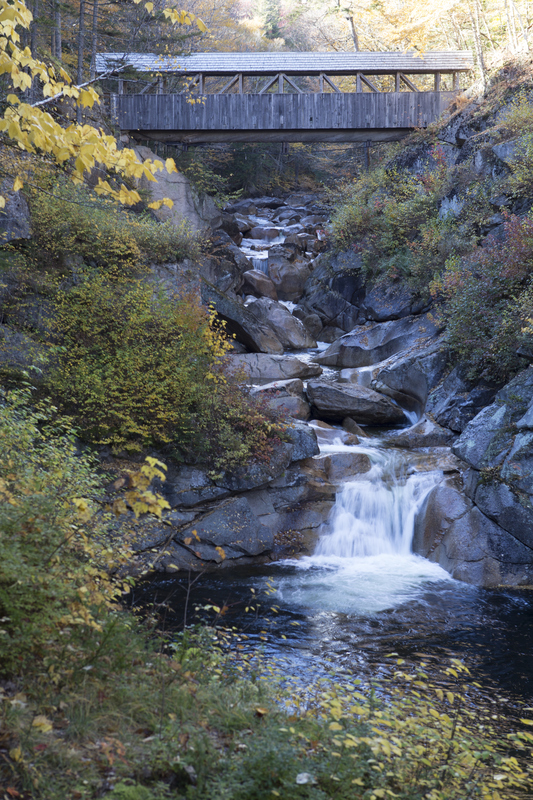 After taking some photos we continued back and up SR 16 to North Conway. Conway is a small sleepy town. North Conway is closer to winter skiing and the Saco river for summer water sports. It is a bustling town. There’s also a Central Conway where you’ll find Camping World and Hills RV, a Winnebago dealer. Driving into N. Conway going north on SR 16 you find an increasing number of small business that give way to small and mid sized strip malls that mark the commercial heart of N. Conway. Going further you approach the old city center with its small shops. This is the touristy part of N. Conway. We drove through town for a “look-see”, turned about, and headed out to a Walmart where we could watch a football match with a clear view to the south and no interruptions. With the antenna deployed and the heater running, we watched the Jets beat the Red Skins. They would have demolished the Red Skins but for a number of JETS turn-overs. 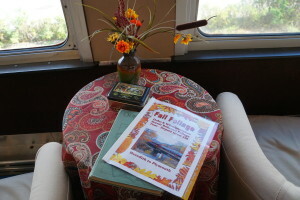 During commercials Ellen called local campgrounds listed as open through October. Most were closed but Eastern Slope Camping was open. We made a reservation and drove over after the game. It was 5 pm when we pulled up to the office. We stayed at Eastern Slope Campground that night. Mike at the desk and Paul the owner were extremely talkative and informative. We were looking to have Li’l Beast serviced in the next few hundred miles. 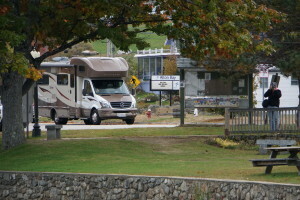 They suggested Hills RV in North Conway. They are very close by, but closed on Sunday. We’d call the next day. We asked for an open campsite for better satellite reception and they gave us site 95 right in the center of the three rows of full hookups in an open clearing. 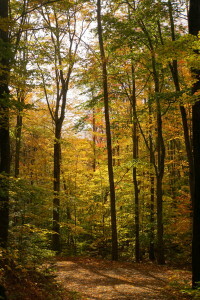 The other sites, around the clearing are in the trees. Beautiful, but with the temperature dipping below freezing, having sunlight in the morning is welcome in addition to good sat reception. 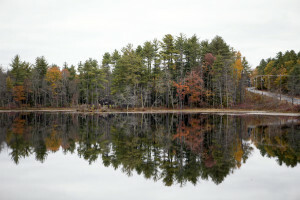 We talked about the local economy, running a campground, how their campground floods every spring, “Look around and you’ll see that one bathroom building was built on stilts, all the electric is built at least four feet above the ground.” The campground is build in a meander of the Saco River. Fully two thirds of the campground floods in the spring. 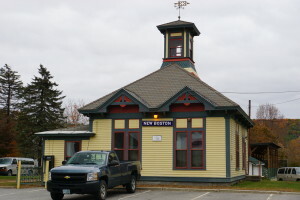 Evidence abounds: the picnic tables are chained down, the electric service boxes are elevated, and the men’s and woman’s restroom building is built on stilts. 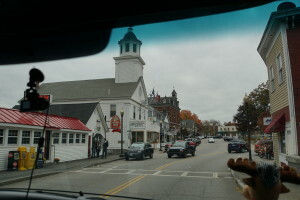 We drove back to North Conway to get Diesel and a jacket for Ellen. The zipper on the one she has is failing and the jacket is old. 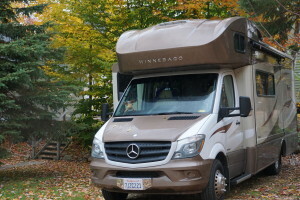 This entry was posted in New Hampshire, RV Trips, To New England and tagged Camping World Conway, Central Conway, Conway, DirecTV, Eastern Slope Campground, Hills RV, Kancamagus Highway, Lincoln Woodstock KOA, North Conway, Winegard on October 19, 2015 by up4air. 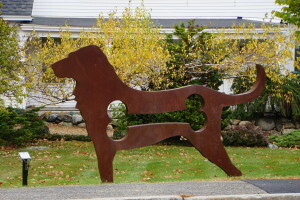 Walt lives in Lebanon NH, very close to our campsite yesterday. 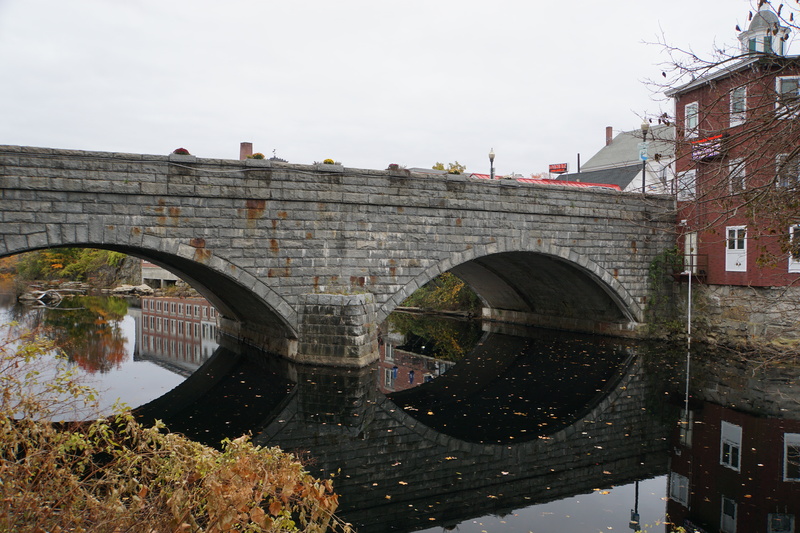 We thought we’d meet at Meredith NH, on Lake Winnipesaukee, but chose to meet at Plymouth, NH. We broke camp, chatted with Carl and Olivia, filled our propane tank, and headed to Plymouth. Our propane tank measured 1/4 full, but only took a bit over 5 gallons of propane. We have a 13 gallon propane tank, so says the view specifications. Why it registers 1/4 full when we have more than half left is a puzzle. Either our tank is less than 13 gal. or we can run the tank down to an empty reading and still have 1/4 tank left. Then again, there are any number of other things that can be at play. The View does not have through-tank sensors, but they are mounted on the side of the tank and may not be super accurate. We arrived in Plymouth rather quickly. It was down-hill and a short 22 mile drive. As usual, we drove through the town looking for likely places to park, U-turned, and parked in the RR-station parking lot. There’s lots of level parking there. While we we parking, we notice an odd thing. There were a number of older fellows milling about the tracks holding cameras at the ready. A short time later a train pulled into the closed station! 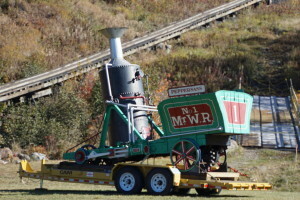 There were four passenger cars with a pusher engine. We joined the photographic frenzy. I actually thought for a moment that Bernie Sanders might disembark! The engine uncoupled, pulled around the cars, and re-coupled at the other end. Then some of the spectators headed to the cars and boarded. The coach captain walked over and invited us all aboard. 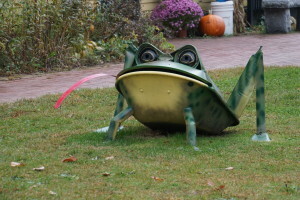 Ellen hopped out of Li’l Beast and followed the captain back to the car and hopped aboard. 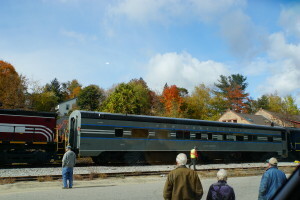 He said that an engineering society had preserved the train as it would have been in its heyday. One car was setup as a private car. A wealthy individual would have owned or rented such a car. The other cars were setup as a lounge with plush overstuffed chairs and a grand piano. 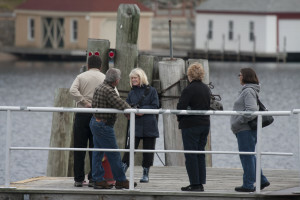 As Ellen went aboard she said she was not a member of the engineering society. 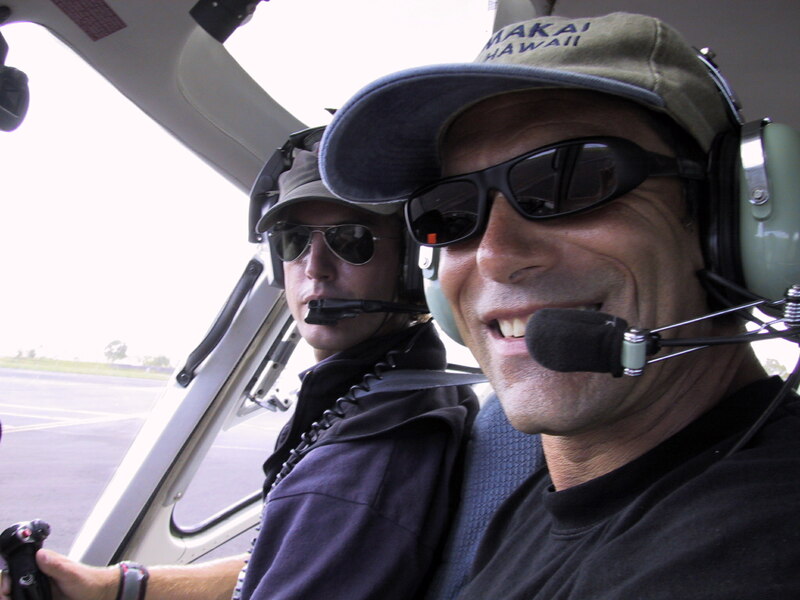 The captain said, “But I’m sure you have engineered your live quite well. Welcome aboard!”. 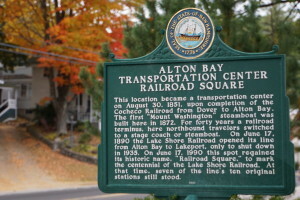 Later Ellen learned that it was the Plymouth historical society that preserved the train. 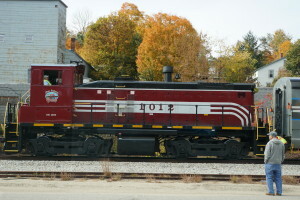 It runs between Plymouth and Lincoln and Meredith now and then; junkets for members and dignitaries. We continued on to main street and recognized Walt walking toward us a few blocks later. 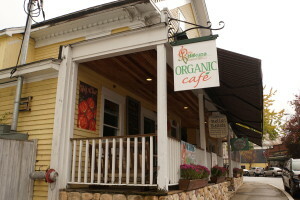 We grabbed a cup of coffee, then walked to “The Common Man Inn and Spa”. Walt had left his jacket in his truck and went back to get it. Ellen and I waited outside a head shop that was warm and pretty busy. 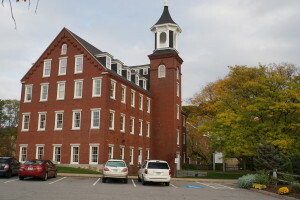 It’s located near the college. We waited and waited, no Walt. Still waiting, up drove a blue truck with Walt at the wheel. “The hotel is over a mile away, I thought we should drive”, said he. We piled in and were; off to the inn. The Common Man Inn and Spa is another not to be missed “landmark”. 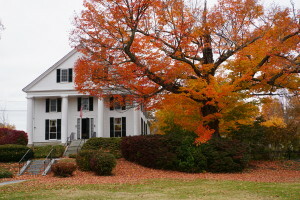 It is an old wood working building converted and expanded into an inn. The entry opens into the gift shop. We walked to the counter to ask where the restaurant is and before we could get a word out, the woman at the counter asked, “Are you with the wedding? The shuttle is here.” We joked with her with a “Yes, if they’ll have us.” Then asked for the restaurant. The bar/restaurant is three stories and has a herb garden and outside seating on a lawn on the third floor roof! 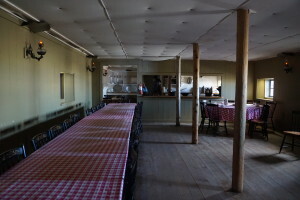 The huge boiler that was used to burn discarded remnants now is a wine cellar and seating for 12 diners at a long table. 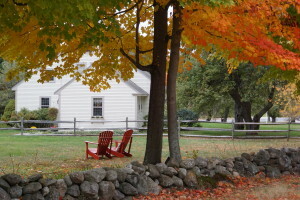 The Inn is open year round. We had drinks, and great conversation over a relatively uninteresting lunch, then decamped to the fireplace in the souvenir/gift shop. As we were talking, the wedding party returned to warm themselves. The bride and groom took front and center in front of the fireplace. We chose to leave them to themselves and walked away. The day went too quickly. Back at home, Walt thought The Beast was a perfect size for us. We spend a bit more time getting warm before Walt left to go back home, Lebanon. We had such a good time with Walt, we forget to take any photos of the three of us or of the inn! Thanks Walt for a great (if short) visit. You’re always welcome, come visit in California some time. We drove back toward Lincoln, found that the KOA, Woodstock was open and camped there for the night. Again,, they closed the next day. This is the fourth time we have closed a campground. 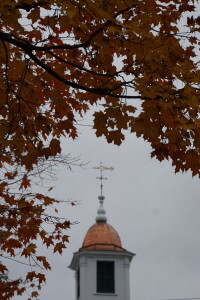 This morning, Sunday 10/18/2015, It was 27 degrees. Our water hose was partially frozen and water pressure was zip. Tomorrow it will be colder and I’ll disconnect our hose. 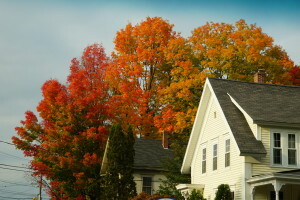 I can’t wait for Indian summer! This entry was posted in New Hampshire, RV Trips, To New England and tagged Fall Foliage, KOA, Plymouth Historical Society, Plymouth NH on October 18, 2015 by up4air. 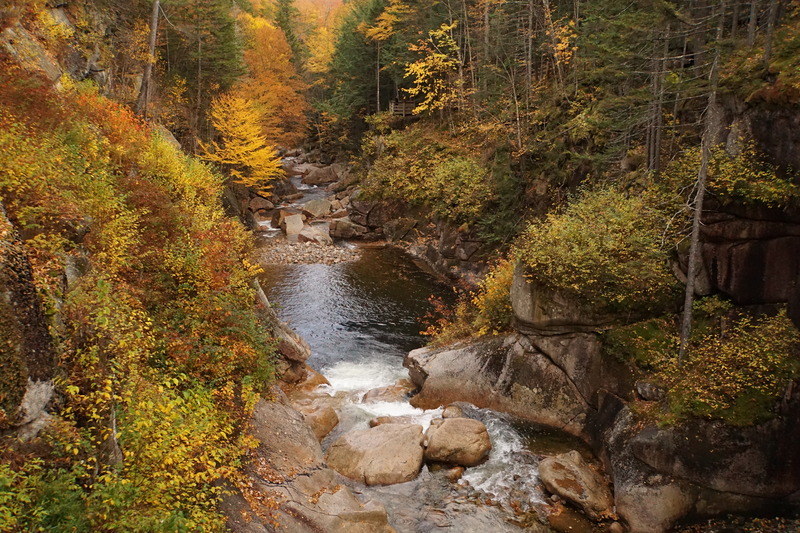 This entry was posted in New Hampshire, RV Trips, To New England and tagged Franconia Notch, New Hampshire, photographs, photos, the Flume on October 17, 2015 by up4air. It was raining this morning. It was a light rain, more a drizzle, but it was wet, cold, and overcast. 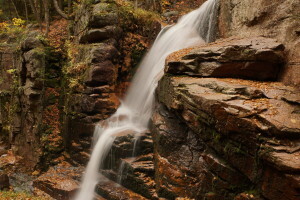 Perfect weather for photography and hiking? No. 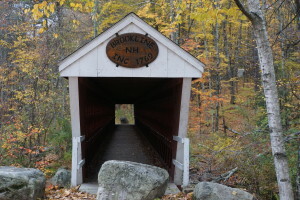 Still, we drove north from Country Bumpkins Campground toward Franconia to check the area out and drive through some of the local towns. Going north we saw the turn-out for The Flume ahead and I turned in. 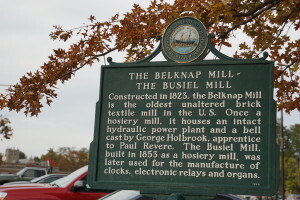 I remember visiting this landmark with mom and dad when I was barely a teenager. I figured we could visit the information center, get some info, and continue north. The information center has changed! 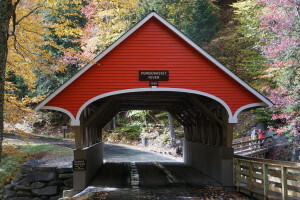 Not only is it the entry to the state park, but it has a souvenir shop AND a restaurant! It is much more developed than I remember fifty years ago. It was still raining and/or spitting when we entered the information center. We looked around some then went to the information desk. Ellen asked a disarming question, not your typical how long how far sort of thing, and we immediately had rapport. Ellen asked about tomorrow’s weather and it did not look good. 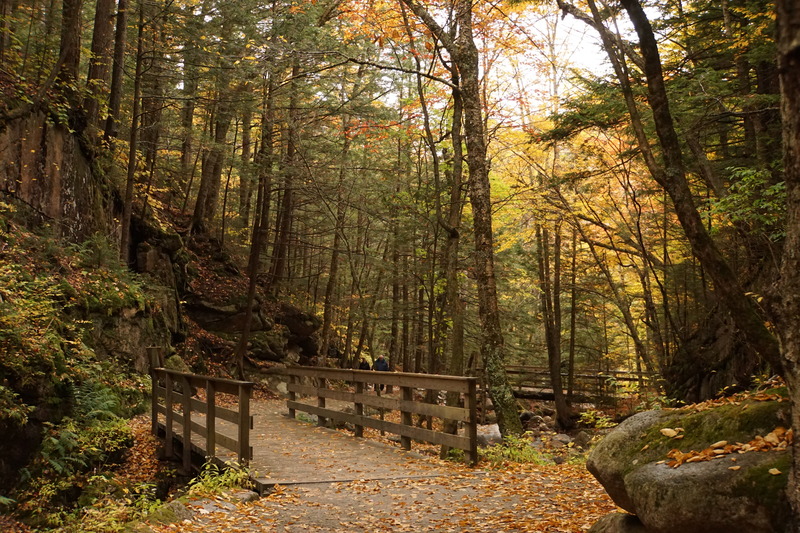 Today was the better day to walk The Flume. We went back to The Beast and changed for rain. While we were changing, the sun popped out from behind a cloud. Great! We headed in to buy tickets. We delayed taking photos out front and delayed sufficiently for a bus load of “tourists” to head in behind us. Now don’t get me wrong, we are all “tourists”, it’s just that I hate being trapped in a sea of people disgorged from a bus. There can be fifty or a hundred people milling about. It makes photography challenging. After we got our tickets we filed to the entrance to the 2 mile walk along with the bus load just as a torrent of rain fell. The bus load waited under the eves, we pushed past as the rain diminished and started our walk. 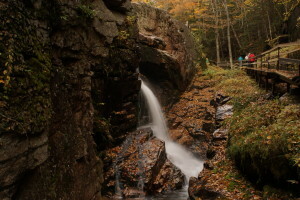 If you are visiting the Franconia Notch area, visit The Flume. 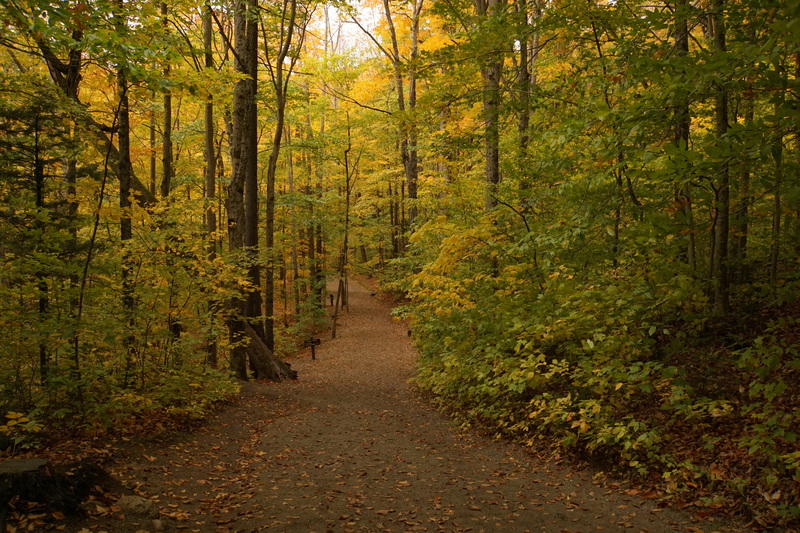 It is exhilarating to be out doors and walking. 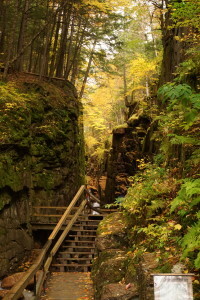 If you enjoy photography, the contract between shadow and sunlight makes for challenging photography, and the flume is an amazing geological formation. We dawdled at the first covered bridge long enough for “the hoard” to catch up. We continued to dawdle and never saw them again. The two mile walk typically takes an hour. It took us 2 1/2-3 hours as we enjoyed our walk through forest then along a gorge and by a waterfall. About half way through our walk the rain subsided and the sun poked through the clouds. What joy! We took our time meandering through the park and soaking in the streaming sunshine. 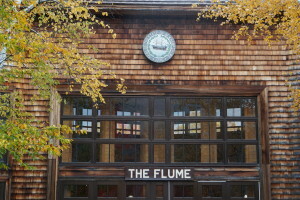 We were told it would take about an hour to walk the Flume. It took us a bit over four hours. We walked, talked, explored Ellen’s camera features, and had a blast. It was past four pm when we arrived at the gift shop/restaurant for a hot dog. They were just ok. 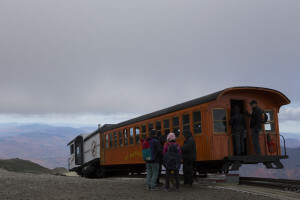 The ones at the cog railway are much better. 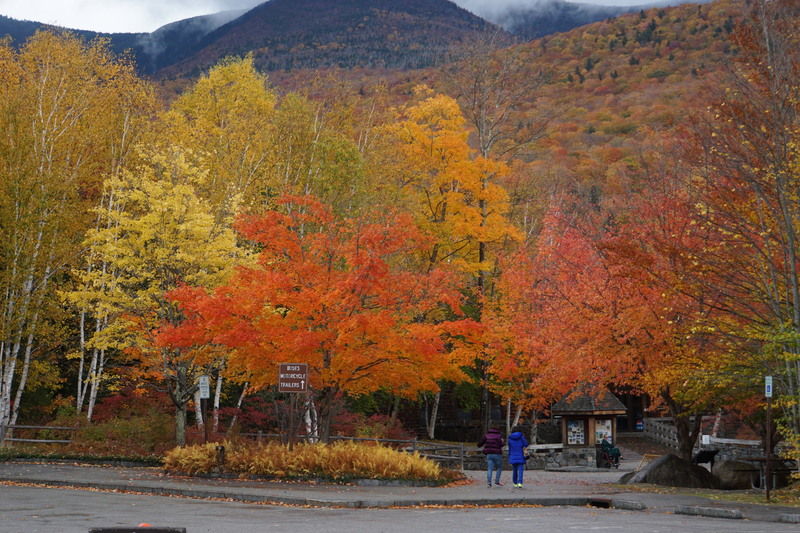 We stopped by the gift shop and saw the same balsam sachets that were available at the top of Mt Washington. I considered getting one there, but the price was pretty high. On the way down the cog, I regretted my decision. The scent of balsam is so Christmasie. There they were and we took one away with us. It sits beside me now filling The Beast with the scent of fall and Christmas. It is wonderful. As we were walking out we met Carl and Olivia coming in. They’re the Surrey couple we had met at Country Bumpkins. 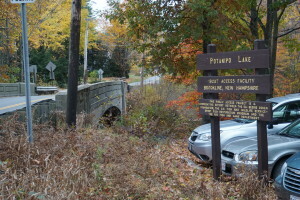 They went to Echo Lake before heading here. I asked if there was an echo and Carl admitted they didn’t want to make a spectacle of themselves and had not tried. We went looking for the towns of Franconia, Lincoln, and Woodstock. 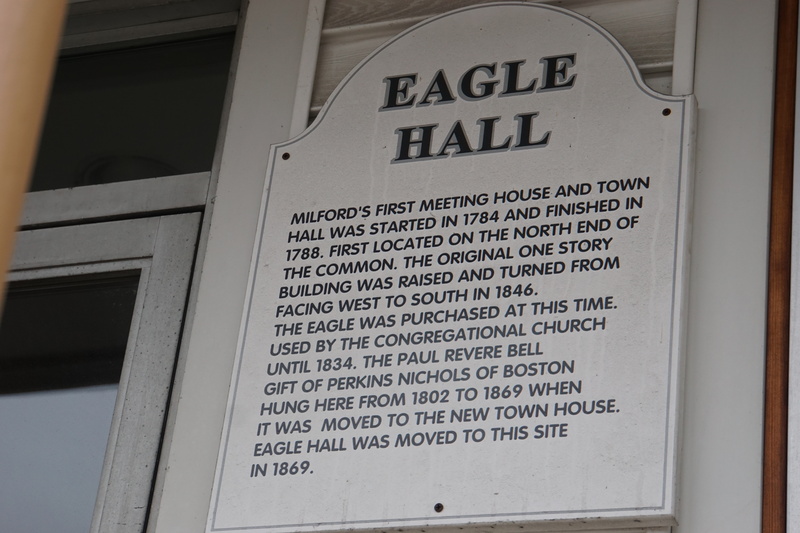 Though the towns were founded in the 1700’s, none are particularly memorable. There is an Iron works in Franconia that is noteworthy, though the town lacks the charm of Littleton or the industry of St Johnsburg. We went back to our campsite at Country Bumpkins. 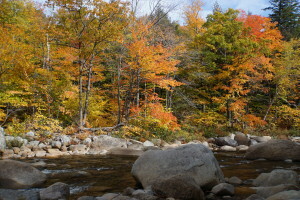 I highly recommend stopping at Country Bumpkins if you are looking for a campsite in Lincoln New Hampshire. This is our second evening here. We changed sites as the one we were at is reserved for this evening. At our new site, we have a good view to the south for sat reception, but the electric box and the water spigot are about thirty five feet apart! We have the hose and electric cable to make this happen. Still it is a strange setup. After connecting and checking level, I fired up the Winegard Sat Antenna. IT buzzed and whirred for a very long time before settling on the satellites. OK. The DirecTV receiver saw a problem connecting to the antenna. There was a small tree directly in the path the antenna had selected for sat reception. No Problem. I’ll just pull back about a foot and that should move the tree out of the way. Trouble is, we had very little slack in the water hose. Backing up a foot is possible, but not two feet. With Ellen’s help, we backed up a foot and sat reception is all good. This evening we took long showers, luxurious shower at the campsite. There are only four showers, 2 men’s and 2 women’s. They have those old dorm shower heads that are usually not so good, but with the water pressure they have, it was great. Also their internet access is quite fast. At other campsites I’ve seen transfer rates as low as 180 Kbps. At Country Bumpkin bursts of 2.4 Mbps are not unusual. Tomorrow we may head off on a side-trip to meet with Walt. 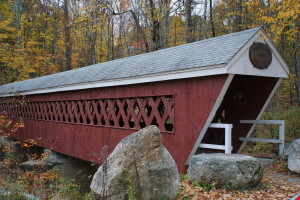 Walt lives in Lebanon NH. 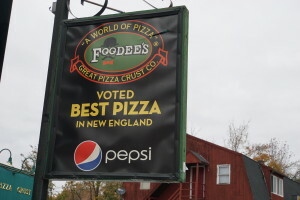 We’ll chose someplace roughly mid-way and spend a day before heading east to Conway NH. We have a rendezvous with a zip line on the way. 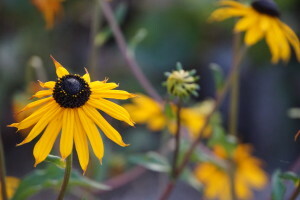 If I have not mentioned it before, Ellen is getting to know her new camera. 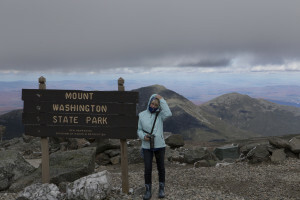 At least half of the photos posted on our blog since we left for New England are her’s. I’m encouraging her to use manual to learn how to handle difficult light situations where auto just cannot cut-it. Her camera has so many modes and options that it will take some time to be comfortable with all its features. 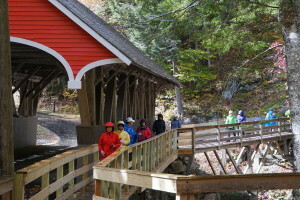 This entry was posted in New Hampshire, RV Trips, To New England, Travel Resources and tagged country bumpkinns campground, Fall Foliage, Franconia Notch, Lincoln New Hampshire, RV New England, RV new hampshire, the Flume on October 17, 2015 by up4air. 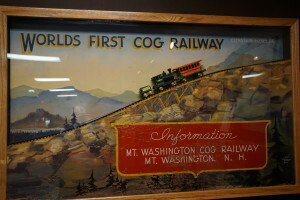 If you are in the Mt Washington State Park in New Hampshire, you would do well to take a ride on the Cog Railway to the top of Mt Washington. 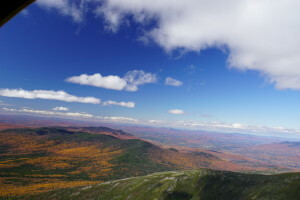 Do this on a clear day, and you will be rewarded with some of the most magnificent vistas east of the Mississippi. 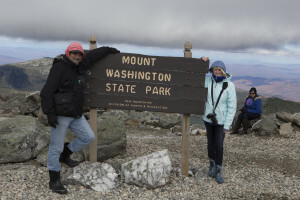 Be warned Mt Washington creates its own weather. 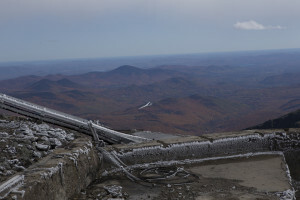 It may be warm at the base station and it could be snowing on top. 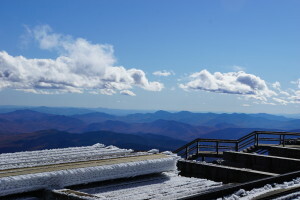 Today it was 54 degrees in the sun at base and with wind chill, -11 degrees at the top! 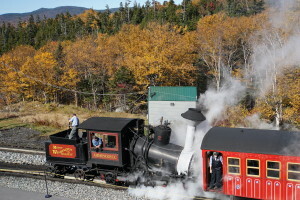 Each day one steam driven train sets out at 9:15 am. 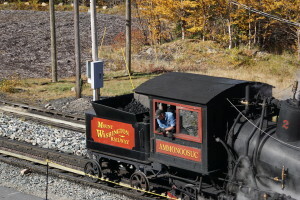 The remaining trains are all bio-diesel. 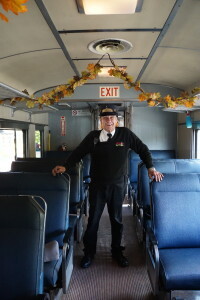 The steam train was booked for today, 10/15. We figured the other trains couldn’t be booked, it was after Columbus Day after all. We left at a comfortable time this morning, around 9:30, which is early for us. Two hours can make a huge difference. At 10 am the skies were clear, it was cold in the shade with a bit of a breeze at the base. 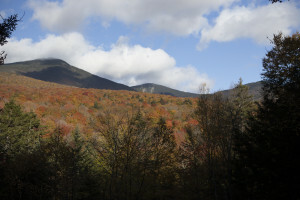 The weather in the presidential range is notorious, it can change drastically in a few hours. 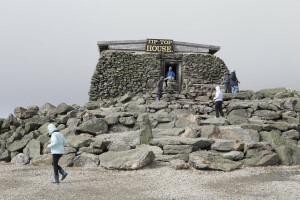 The world recorded wind speed of 253 MPH was set in 2010 on the top of Mt Washington. The mountain creates its own weather. The ride to the top goes quickly. It does not feel like an hour ride. 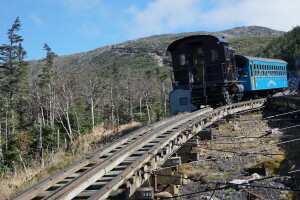 About half way up the tracks double up and up and down bound trains pass each other. The air temperature grows much colder nearer the top and the wind picks up on the ridge. When we left the base it was 54 degrees. At the top the temp was -11 with wind chill. It was cold. The warming hut I thought I remembered from 40 years ago, is no more. Perhaps I’m remembering the Tip Top Hut. 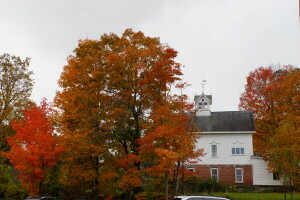 Today there is a large warm building that houses a restaurant, a gift shop, and a hiker’s information desk. 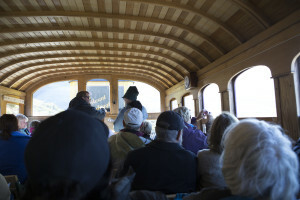 We headed inside right away waiting for the crowd outside to disperse; some boarding the trains back down the mountain, others milling about until the cold got the better of them. In a short time we went back outside to explore in relative peace. 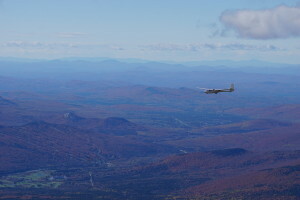 We saw a glider decouple from its plane and soar below us. 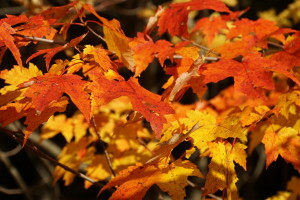 We marveled at the vista of fall colors. 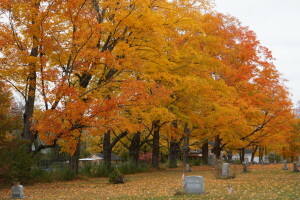 The trees to the north were past peak while the trees to the south looked to be peaking. There was significantly more red color to the south. We were freezing. We popped into a small hut to warm up and found ourselves in a small souvenir nut. The scent of pine filled the hut. Ellen found a sweat shirt she liked and I came very close to buying a balsam pillow. Once we warmed up, we headed back to the main building for cocoa and apple cider. 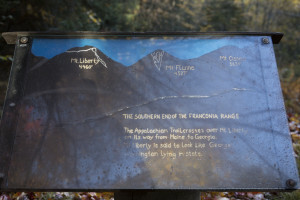 The hiker’s desk was not busy. I asked about Tuckerman’s Ravine and we were off. Kevin and I discussed Tuckerman’s, skiing Mt Washington, the east coast, Tahoe, new skis designs, snow quality. 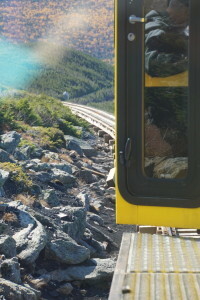 We had a great time until we noticed the queue for the train down the mountain. This time we were at the end of the line and were separated on the ride down. It was no problem, Ellen sat behind me and often warmed my ears. There really is no bad seat on the car. The views on the way down were stellar. The skies were clear, though we had seen clouds blowing past the mountain top. Descending, can you find Ellen? We thawed out at the bottom, both agreeing that this day was “awesome”. Remembering the chili the restaurant served for lunch, we visited the base station restaurant to find gaping holes in the counter where the soup and chili pots had been. No Problem, the counter guy said, we have lots. We bought two pints to heat for dinner later. Next, in the gift shop I mentioned in an off hand way that I’d like to see a moose in the flesh. A local standing beside me told me where I might find some Moose, their habits, and Ellen mentioned the declining moose population caused by ticks. 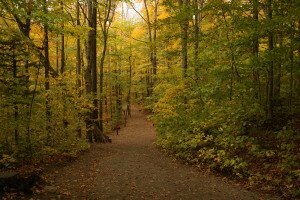 We were off on a wide ranging discussion about: climate change, life style, ticks (his dog never had an issue with ticks until three years ago, now he sees deer ticks all the time, some moose have over a thousand ticks on them and they’re anemic) and population growth as the cause of “it all”. People have the time to stop and engage in conversation here. Is it just New York and New England? I’ll pay closer attention as we work our way back west in four or six weeks. We headed toward Franconia Notch thinking we could get south of the notch and setup camp before nightfall. On the way we stopped at a road-side outlook. 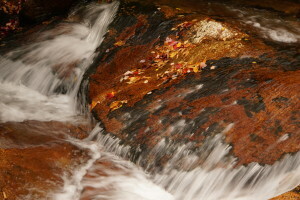 There are a number of campsites in and around the notch and more than a few to the north and south. We settled on “Country Bumpkins” in Lincoln. 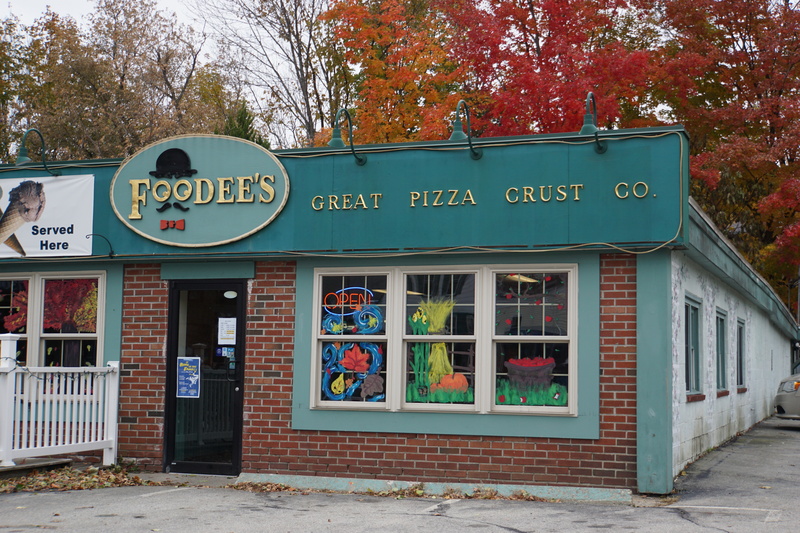 They are open through the end of October (the owner said; not really, they close next week). 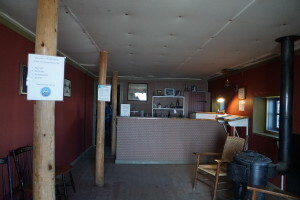 They have a variety of options for hookups from full to electric only, they have WiFi, and cable. 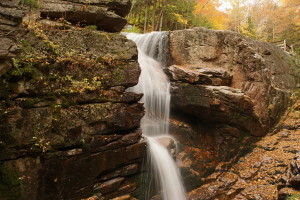 Setting up camp is usually as simple as pushing an electric plug into a socket, screwing a water filter into a spigot, quick-connecting our water hose to the filter and to the RV, and pushing out the slide-out. In warmer weather we might pull out an outdoor mat, chairs, and a BBQ and unfurl the awning, but when it’s cold less is more. In the cold we are quickly mobile; breaking camp can be done in a flash. As usual, we drove past the campsite, turned around, and checked in. There was a couple from England ahead of us. 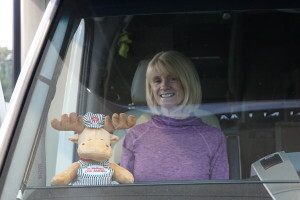 Carl and his GF flew from Surrey to Boston and rented an RV for two weeks to tour New Hampshire and Massachusetts. We had a good time talking about our trips, his work (an architect), and the future. Carl was fascinated to think that he could just drop everything and be an RV nomad full time. 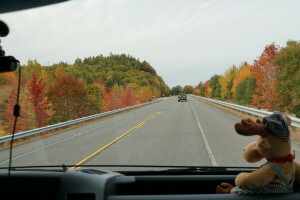 He’s been bitten by the romance of the open road and the beauty of New England in the fall. Up the next morning to the patter of light rain. It’s overcast but not raining now. We’ll stay another day at Country Bumpkin Campground. The site we were at last night, #38, is taken tonight. Amy wrote out a list of available sites, we walked the campground and chose #26. 26 has a clear view to the south. Amy is a warm caring woman. She’s fun and it is easy to while away half an hour simply chatting with her. Amy’s warmth extends to the campground. 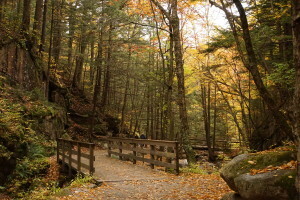 It is nestled in a small wooded valley with a creek flowing through the campground that flows into a river. They have Country Bumpkin photo walls. You know the type, a painting of two or three people with oval head cut-outs. You put your head in the oval and you’ve got your very own country bumpkin photo. 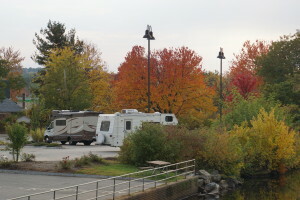 The campground office closes at 9 pm; quite late for an RV campground. 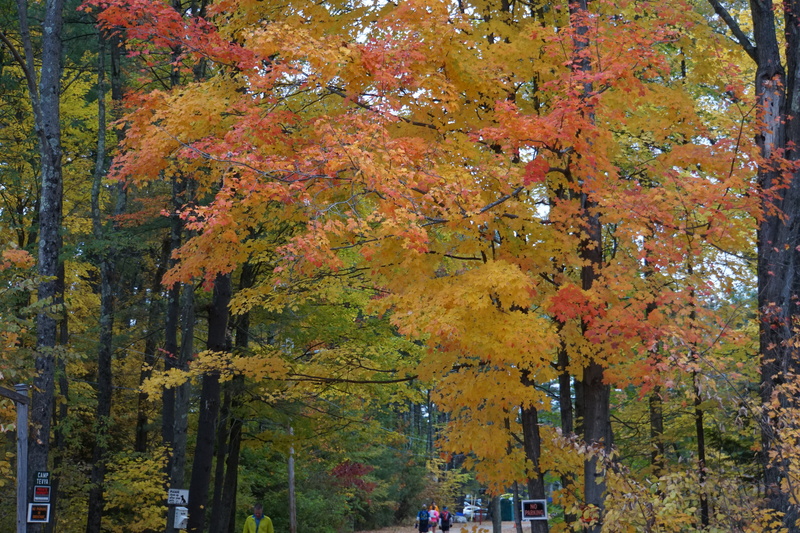 The campground is closing for the year this Sunday, 10/18, with no overnight camping on Sunday. Campground availability is closing down. Amy said she and her family stay year-round. She starts taking reservations for 2016 in January. 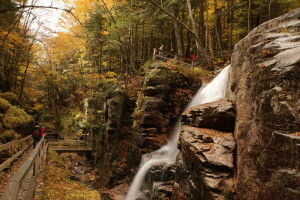 Today we’ll visit the towns of Franconia, Lincoln and Woodstock, maybe take the walk to The Flume weather permitting. 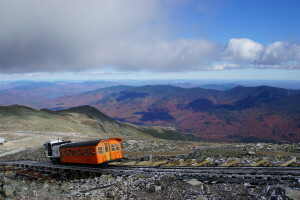 This entry was posted in New Hampshire, RV Trips, To New England, Travel Resources, Uncategorized and tagged Ammonoosuc Campground, Cog Railway, Country Bumpkin Campground, Fall Foliage, Franconia Notch, Mt Washington, New Hampshire, Steam Engine, Tip Top House on October 16, 2015 by up4air.